Sometimes children may need a little encouragement to do something on a regular basis. They can be used to encourage kids to keep their bedroom tidy, as a reward for working hard at school, or even as a reward for healthy eating (eg. NHS Change 4 Life programme). We have used them in the past which came from a high-street store, but when I tried looking recently I was unable to find them anywhere. I've since found some online (eg. Reward charts at Amazon.co.uk ), but I had instead made my own. I've created a Blue and a Pink version (but the original source file is included if you want to change to the colour scheme of your choice). 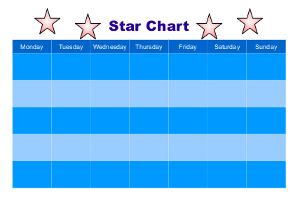 The charts can be printed on a home printer and then just add star stickers from a local stationary store. The chart was created using OpenOffice.org which is free and includes a graphics draw application. This will also work well with LibreOffice (which is currently available as more recent release - again completely free!). You could even use the OpenOffice.org file to create a personalised one for your child using a favourite photo or clipart.